For me, the most exciting thing about urban fantasy is the idea of magic intertwined with the everyday world. Imagining that there’s a secret supernatural world thriving just beneath the skin of our mundane existence leads to a rich world of “what if’s.” What if humans could bend the elements to their will? What if ghosts wandered, unseen, through hospital corridors? What if oracles can tell the future by looking into a flame or shuffling a deck of cards? I especially love the idea of magic, of humans being able to touch and manipulate unseen powers. But wielding power would make our heroes and heroines gods, unless the magic has a price. Most epic fantasy literature requires that the exercise of unnatural power has a cost to the user, and that idea has permeated urban fantasy, as well. Vampires, for example, are given immortality. But they sacrifice the day, and must submit to the bestial act of taking blood from another to gain that power (most of them, anyway). Werewolves fall sway to the unreasoning spell of the beast in moonlight, in exchange for physical power and healing. These costs apply to nonhuman creatures, and we’re familiar with that trading of life and magic. But what about human heroes and heroines? Does bending the fabric of reality to suit their goals also bring suffering upon them? What do they trade to be able to work magic? I think that human protagonists must also make a trade; there’s no free lunch in the universe. Even if a magical heritage is forced on them, and not something sought out willingly. With that in mind, I created my heroines with an ambivalent relationship toward their magical powers. In EMBERS, Anya Kalinczyk is the rarest kind of psychic medium, a Lantern. Where other mediums allow spirits to use their hands and voices to communicate, Anya devours ghosts. It’s a talent she had no choice in - she’s always been a Lantern. And it comes in handy in her nocturnal work as a ghost hunter. But she wrestles with the costs. The first cost is physical. Devouring a spirit leaves a burn, a scar, on her body. The second is psychological - Anya feels apart from ordinary humans, and can’t make a connection with her fellow ghost hunters. And the last one is spiritual. Anya wrestles with the idea of what happens to a ghost after she incinerates it. Does it go forward into an Afterworld? Or has she killed it entirely? In DARK ORACLE (which I write under my Alayna Williams pseudonym) Tara Sheridan has a more subtle magical ability, but it’s brought her more pain. Tara is an oracle, a criminal profiler who uses Tarot cards to solve crimes. Like Anya, she had no choice in it - it’s a gift given to her by her mother. While pursuing a serial killer with her talents, she was attacked and left for dead. Tara survived, but she was scarred for life and left barren - a very dear physical cost. She exiled herself from society, swore of the cards, and seeks tranquility in swearing off magic - until duty comes knocking. A scientist working with dark matter has gone missing, and the society of oracles to which she belonged desperately needs her help to locate him. Tara must decide whether to pick up the mantle of magic again, to assume the role of oracle, and endure further costs. Without a price to magic, our heroes and heroines would be gods, immune from the consequences of their actions. We’d all like to think that we’d embrace the reins of power willingly. But I don’t think it would be that simple. By adding a bit of magical karma and conflict to the story, their humanity shines through more clearly. Question for readers: If you could choose a magical power, what would it be? Would you foresee any costs to having a hidden power in your own life? 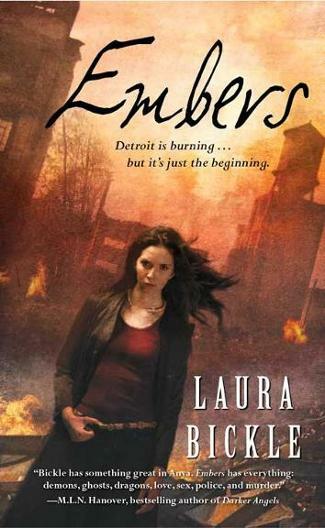 EMBERS is available now from Amazon.com and Barnes & Noble. 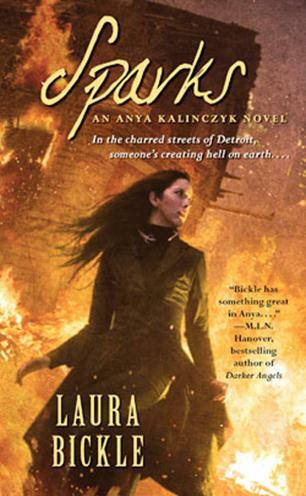 Anya Kalinczyk is the rarest type of psychic medium, a Lantern, who holds down a day job as an arson investigator with the Detroit Fire Department—while working 24/7 to exterminate malicious spirits haunting a city plagued by unemployment and despair. Along with her inseparable salamander familiar, Sparky, Anya has seen, and even survived, all manner of fiery hell—but her newest case sparks suspicions of a bizarre phenomenon that no one but her eccentric team of ghost hunters might believe: spontaneous human combustion. Laura Bickle has an MA in sociology-criminology (research interests: fear of crime and victimology) and a BA in criminology. She has worked in and around criminal justice since 1997. Although she does read Tarot cards, she's never used them in criminal profiling or to locate lost scientists. She recently took up astronomy, but for the most part her primary role in studying constellations and dark matter is to follow her amateur astronomer-husband around central Ohio toting the telescope tripod and various lenses. Writing as Laura Bickle, she's the author of EMBERS and SPARKS for Pocket - Juno Books. Writing as Alayna Williams, she's the author of DARK ORACLE and ROGUE ORACLE.